This chapter explains how you can quickly create an XpertMatrix™ using the XpertMatrixAdd™ tool. 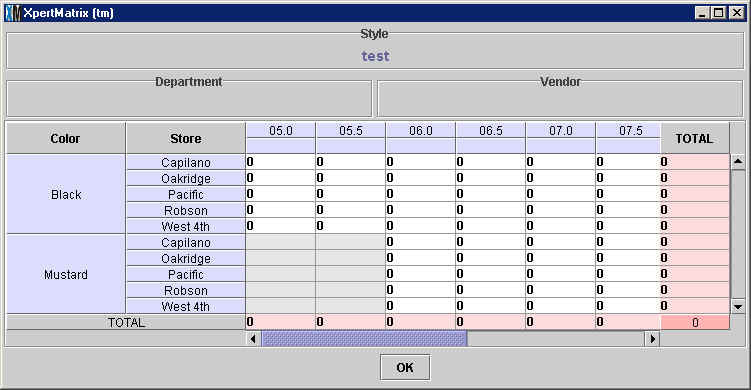 When you consider that the typcial retailer can have around 800 styles in a clothing or shoe store and each style has its own Size/Color matrix, knowing how to use this tool will save you lots of tedious data entry. Before you can use the XpertMatrixAdd™ tool you need to first enter colors into you Colors Catalog and Sizes into your Sizes Catalog (along with entering Second Sizes into the Second Sizes Catalog if you plan on using them). The next step after that is to define any size "runs" or Size Matrices (and Second Size Matrices) you will want to use. After you've done this initial setup, you can create a new matrix for a Style in a matter of minutes. Begin by entering the colors your merchandise comes in into the Colors Catalog. (If you are not familiar with the basic layout of a catalog, read the Catalog topic before continuing). Entering colors should take very little time since all you really need is the name of the color (though you can also include a sample of the color as an image if you are going to be using many similar colors with subtle differences). The names of the colors can be as long as you need them to be. Don't worry if you need to add more colors later on as you receive new merchandise. IMPORTANT NOTE: Take care not to duplicate existing colors. 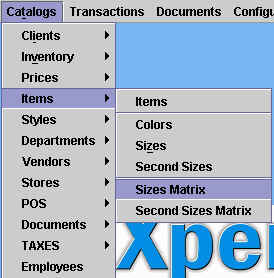 At the moment, XpertMart™ will allow you to, for example, add two "Black" colors to the catalog. If you have any doubts, do a query to make sure the color you want to add is not already in the catalog. If you try to delete a color that has already been used by an Item, you will see this error message and XpertMart™ will not allow you to remove the color from the Colors Catalog. If you really need to eliminate the color, you can always rename it with the name of a new color. Be aware that all Items that refrence this color will not use the new color. The Sizes Catalog is one of the few cases where you might want to fill in the Code field, depending on the design of your bar code labels. Some retailers prefer to have the size code appear on the bar code label instead of the complete size name. If you want to use the size code in your bar code labels, talk to your XpertMart™ dealer to make sure you are using the correct printer driver. If you plan on using Second Sizes, for example for the sleeve length in men's suites or for the width of shoes, then you will also need to fill in the Second Sizes Catalog. The Second Sizes Catalog is very similar to the Sizes Catalog. Once again you need to pay attention to the alphanumeric ordering of second sizes you enter into the Second Sizes Catalog. If, for example, you want to use Narrow, Regular and Wide as your second sizes, you should put a space before the word Narrow to makes ure " Narrow" is displayed before "Regular" in the Second Size Matrix. Entering a Code for the Second Size is optional. In most cases, you will not need to use a code, unless you want to print the Code on the bar code label. 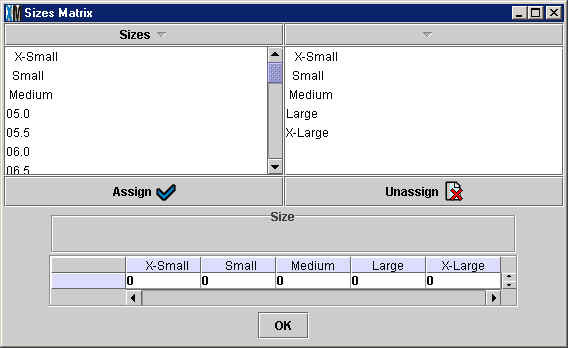 Once you have entered all of your sizes into the Sizes Catalog, the next step is to creat size runs or size matrices. Having pre-defined Size Matrices will save you a lot of time if multiple styles use the same run of sizes. You can use a pre-defined Size Matrix instead of having to assign the sizes you will use every time you create a new Style in the Styles Catalog. Once you've entered the Sizes Matrix Catalog, you can create a new Size Matrix by clicking the New Record button in the toolbar. You will will need to name the Size Matrix you are creating. Using descriptive names that specify the actual sizes being uses is highly recommended since you will end up adding as many as doznes of Size Matrices and it might be difficult later on to remember which sizes they contain. 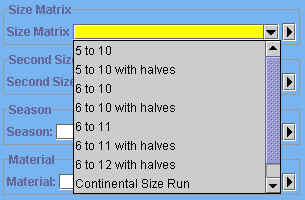 In the example below, the user is creating the "5 to 10 with halves" Size Matrix. Once you have named the Size Matrix, click on the Matrix button in the toolbar. This will open a new window (shown below) where you can create the Size Matrix by assigning the sizes you want to the new matrix. On the left side of the window you will see every size you have entered into the Sizes Catalog listed in alphanumeric order. To add a size to the matrix, select the size from the list (it will appear highlighted in blue) and click the Assign button . As you add sizes, these will appear on the right side of the window. At the bottom of the window, the Size Matrix is automatically built and modified every time you add a size. In the example above, the user has added sizes 05.0, 05.5, 06.0, 06.5, 0.70, 07.5, 08.0 and 08.5 to the Size Matrix and is in the process of assigning size 09.0 to the "5 to 10 with halves" Size Matrix. 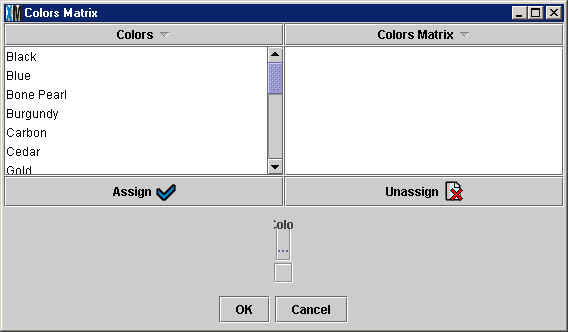 To remove a size from the Size Matrix, select the size from the right side of the window and click the Unassign button . When you are finished assigning sizes to the Size Matrix, click <OK>. After you click <OK> the window will close and you will return to the Sizes Matrix Catalog. Be sure to click save before exiting or creating a new Size Matrix. If midway through creating a new Size Matrix you discover that you need to add a size to the Size Catalog or need to modify an existing size, you can always press <OK> to close the matrix window and the work that you have done on the matrix is automatically saved. You can then enter the Sizes Catalog to add or modify sizes (for example, if you need to add spaces to the name of a size to change the order it will appear in). At any point you can return to the Sizes Matrix Catalog to add or remove sizes to an existing Size Matrix. However, you should be careful not to modify a Size Matrix once it is being used by a Style. If you are using Second Sizes, then you will also want to create Second Sizes Matrices. The process is the same as creating a Sizes Matrix. You will first need to name the Second Sizes Matrix. Once again, using descriptive names is recommended. Next, press the Matrix button in the toolbar and assign the Second Sizes you want to the Second Size matrix. 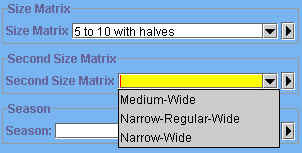 In the example above, the user has assigned " Narrow", "Regular" and "Wide" to the Second Size Matrix. Notice that only Second Sizes appear on the left side of the window. If you need to use the same size for both the Sizes Matrix and the Second Sizes Matrix, you will need to enter it into both catalogs. For example, if you want to use "Unisize" in both places, you need to enter "Unisize" into both the Sizes Catalog and the Second Sizes Catalog. Once you are done with the preliminary work of entering your Sizes and Second Sizes and setting up your Sizes Matrices and Second Sizes Matrices, you are ready to create a complete Style/Size/Color matrix or XpertMatrix™. You can create a new XpertMatrix™ every time you are creating a new Style. In the Styles Catalog you will see a Lookup by Example Menu for the Size Matrix. When you click on this menu, every Size Matrix you have previously created will appear in the drop down menu. Select the Size Matrix you would like to use based on those sizes that the Style is available in. For example, if the new style of sandal you are creating in the Style Catalog comes in sizes 5 to 10 and includes half sizes, you will want to select the "5 to 10 with halves" Size Matrix. If the new style has a size run that is different from any of the Size Matrices you see in the menu, then you will need to create a new Size Matrix before you continue. Once you create the new Size Matrix, it will appear in the drop-down menu the next time you click on it. Once you have selected the Size Matrix you are going to use, click on the Matrix Add button to create a new XpertMatrix™. This will open a new window where you can select the colors you want to include in the matrix. In this window you will see every color that you have entered into the Colors Catalog listed on the left side in alphabetical order. (To see them in reverse order, click on the "Colors" bar at the top. You will see the faint gray triangle to the right of the word "Colors" pointing up and the order of the colors reversed). You can add colors to the matrix by selecting on the desired color to the left and clicking the <Assign> button. When you have added your first color, the XpertMatrix™ will automatically appear at the bottom of the window with sizes along the horizontal axis and the colors along the vertical axis. Notice in the example above that the sizes run from "05.0" and "05.5" to "10.0"-- exactly the sizes that were specified in the "5 to 10 with halves" Size Matrix. The user has added the colors "Black" and "Mustard" to the matrix. Recall that the color "Mustard" was added to the Colors Catalog earlier in the example. You can removed colors from the matrix by selecting them from the right side of the screen and clicking on the <Unassign> button. Every cell in the matrix is a size/color combination and contains an empty checkbox. This means that the size/color combination exists in theory but will not be created until you check the individual checkbox. This is because some sizes may not be available for certain colors. In the example below, sizes "05.0" and "05.5" are not available from the vendor in Mustard, only in Black, so the appropriate checkboxes have been left unchecked. Every cell in the matrix is in fact an Item. When you press the <OK> button, you are in fact creating an entry in the Items Catalog for every size/color combination you have checked. In this case, the user is creating 20 new records in the Items Catalog. There are 11 Black items, in sizes 05.0, 05.5, 06.0, 06.5, 07.0, 07.5, 08.0, 08.5, 09.0, 09,5 and 10.0; and 9 Mustard items in sizes 06.0, 06.5, 07.0, 07.5, 08.0, 08.5, 09.0, 09,5 and 10.0. You can verify this by opening the Items Catalog and doing a Query by Example for the new Style you have created. When you click <OK> to close this window, you might experience a brief dealy since at that moment XpertMart™ is literally creating the new records in the Items Catalog. When you exit the window and return to the Styles Catalog you can click on the Matrix button to view the XpertMatrix™ you have just created. 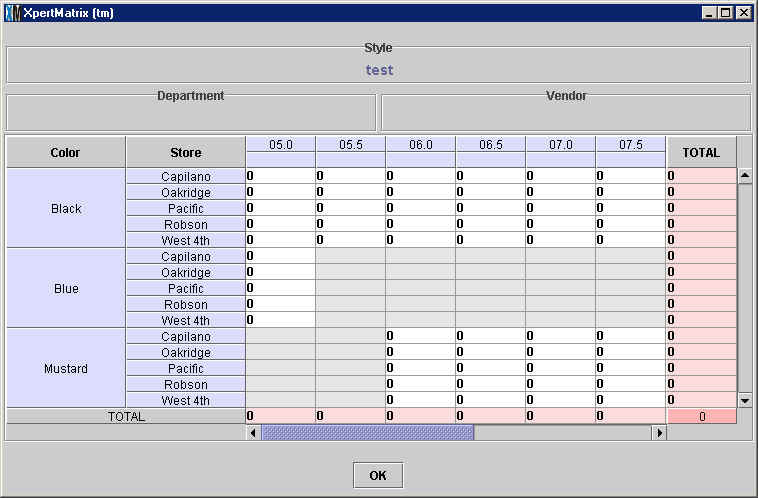 Notice that the stores appear in the XpertMatrix™ even though you did not add them yourself. This is because XpertMart™ automatically "reads" how many stores are in the Stores Catalog and displays them in the XpertMatrix™. All of the cells appear with 0s in them because you haven't received merchandise yet; you have only created the Items that make up the Style. To actually add stock to your inventory you need to create a Receipt. Those cells that appear in gray with no number in them indicate that the Item does not exist in the Items Catalog. In this case, sizes 05.0 and 05.5 do not exist in the Mustard color because they were not selected when the matrix was created. The 0 in the cell indicates that you can receive that Item and add stock to your inventory. The gray cell indicates that you cannot receive that Item as it does not exist. 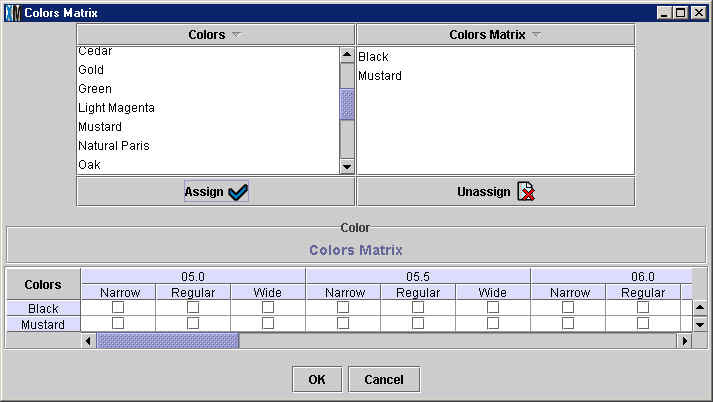 You can always edit the XpertMatrix™ by clicking on the Matrix Add button and adding the colors and sizes you wish. However, be careful not to remove a color or size once you have begun using that specific size/color combination (for example, you have already created a Receipt for those Items and have them in stock). If you want to create an XpertMatrix™ that includes Second Sizes, be sure to select a Second Size Matrix in addition to selecting a Size Matrix from the drop-down menu in the Styles Catalog before clicking on the Matrix Add button in the toolbar. The procedure for creating the matrix is the same, only this time as you add colors you will see both Sizes and Second Sizes along the horizontal axis of the XpertMatrix™. Now instead of one checkbox for every size/color combination there are three since the Second Size Matrix that was selected includes three Second Sizes. Once again, be sure to only select those checkboxes that represent actual Items that your vendors offer. While creating an XpertMatrix™ using the Matrix Add tool is the fastest way to create Items in the Items Catalog, it is not the only way. You can create Items directly in the Items Catalog. When you do, you are creating the XpertMatrix™ from the "bottom up" instead of from "the top down". Notice that by adding just one new Item, the matrix now looks markedly different than it did before. A row for Blue Items has been added to the matrix. Of these, the cells corresponding to Size 05.0 have 0s in them, showing that the Item exists in the Items Catalog even though there is currently none in stock. The rest of the cells of those sizes appear in gray because those Items do not exist in the Items catalog yet. You can add those items in one of two ways: a) by opening the Matrix Add tool from the Styles Catalog and selecting the checkboxes for those size/color combinations you want to add to the Items Catalog; or b) add the Items individually in the Items Catalog. As you do, each cell in the matrix will go from being gray to having a 0 in it. It is important to keep in mind that the XpertMatrix™ can be modified both through the Sytles Catalog using the Matrix Add tool and through the Items Catalog. Any change made in either place will be reflected in the other.